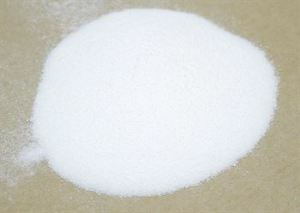 Boora: Boora is one of the variants of crystallized sugar. It is preferred to crystallized sugar as it gives a definite crunch to the dessert and does not hydrate (absorb water) when kept in open air. Boora is made after processing crystallized sugar and is usually used to make ladoos and peda. It enhances the taste of ladoos or any sweet that is made with boora. Place a heavy bottomed non stick pan on medium heat. Add sugar and water in it. Let the sugar-water mixture come to boil. Stir the mixture continuously for 2-3 minutes. Add in the milk to sugar-water mixture. Remove the dirty foam, which starts appearing over the mixture, using a ladle. Using the milk to remove the impurities of the sugar is standard practice to achieve the white end product (o impurities). Cook the mixture for 8-10 minutes. The mixture starts turning extremely thick and translucent. Check the consistency of the sugar syrup by pouring a drop of the sugar mixture on the plate and it will crystallize in few seconds. Transfer the pan to the kitchen shelf. Stirring continuously, add in the ghee to the mixture. Keep stirring the mixture continuously to bring down the temperature of the sugar mixture. Boora is ready and can be used to make ladoos at home. Boora can be stored for over 2-3 months. After the addition of ghee, the more vigorously you stir the sugar mixture, the finer your boora will be. If you have any queries regarding the Boora recipe, please leave a comment.